Johnnybhai had an open soul. And there was never a sad moment. My association with Johnnybhai had been a long one. Probably that's the reason, now that he is no longer with us, it's difficult to put a finger on whether he was a sophisticated person, a good friend or an exquisite artiste. I feel he was one of those few people who had all three qualities. Johnnybhai's house always seemed like a hostel to me. At any time, there were 8-9 children present in his house. Besides them, his relatives and friends dropped in frequently. I never saw him get bothered by all this. He called every one of them by their name and they too got along with him, no formalities involved. His wife, Noor Begum, took really good care of Johnnybhai and the children. He was fond of flying kites. Come kite-flying season and he would be on his terrace. Since my brother also liked to fly kites, he too would join in. 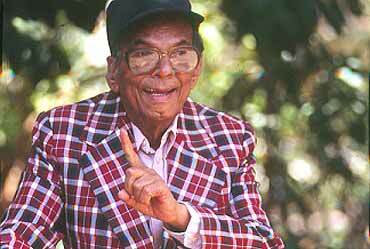 Naushad saab was another person who enjoyed kite-flying. Whenever the strings of their kites met in the sky, it was a 'mini-war' of sorts. They had a lot of fun teasing each other. Gradually, I must admit that I also got hooked, but I had so little time that it never really became a passion. Honestly speaking, at the time Johnnybhai was the one person with the least free time but he always maintained his passion. I would have a few films but Johnnybhai was always working in 7-8 films. Amidst all this, he could somehow still find time for flying kites. He also enjoyed his mehfils with friends. His other passion was hunting. He had friends in all sorts of places who joined in his expeditions. They went hunting in a group of 5-6, going in two or three jeeps. And when they returned after two or three days, we would get to hear the hunting tales—in Johnnybhai's typical style. He was an amazing storyteller, and his anecdotes always made us roll around in laughter. I remember one such tale from a hunting trip of his. Apparently, once as he and his friends were waiting for a tiger, it crept in from behind and came very close to them. The story goes that the tiger's tail brushed past his friend Suresh (he was a young artist). Now, the petrified hunters had no option left but to scare the tiger away by making all kinds of noises. I always asked him when he got back, 'Johnnybhai, how many tigers did you kill this time?' He used to tell me, 'Two or three', and I would tell him say thirty, you are the boss here, who can question you. And Johnnybhai used to break into resounding laughter. No moment spent with Johnnybhai was a sad one. He had a style that melted away all your sorrows. In those times, not many in Mumbai followed shayari, but he used to have a really fine repertoire. On one occasion, he recited so many lines with 'Jahan jahan tere waade pe aitbaar kiya...' (Whenever I trusted your promise...) that while others were busy appreciating him, we could hardly contain our mirth. Johnnybhai never mentioned films outside the movie sets. He always had tales of hunting, of nights spent in the jungle, and of snakes and of flying kites.